I am joining up with Jennifer at A Dab of Glue Will Do and some other blog friends to bring you Winner Wednesday. On the first Wednesday of every month, she is hosting Winner Wednesday. You blog about one of your products in detail and include pictures. Then, you have a raffle that lasts just for that day. The next morning, the winner is announced and is sent the product for free. Sounds fun, right? An easy way to discover some new products and sellers. If you want to participate next month, contact Jennifer for more details. Click the picture above to see who else linked up and what other freebies they are giving away today. 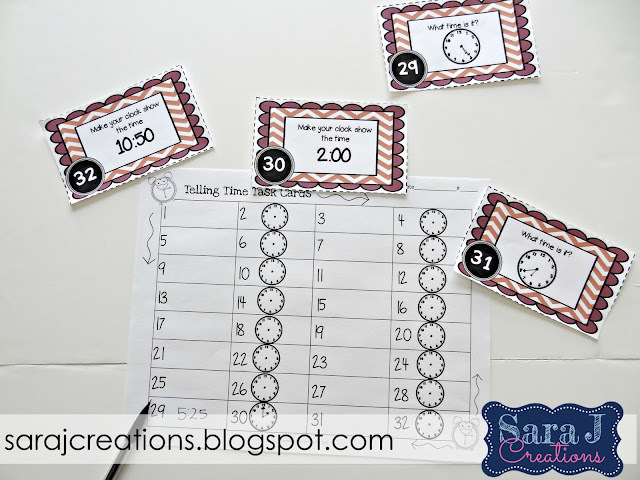 Today, I am giving away my telling time math centers. 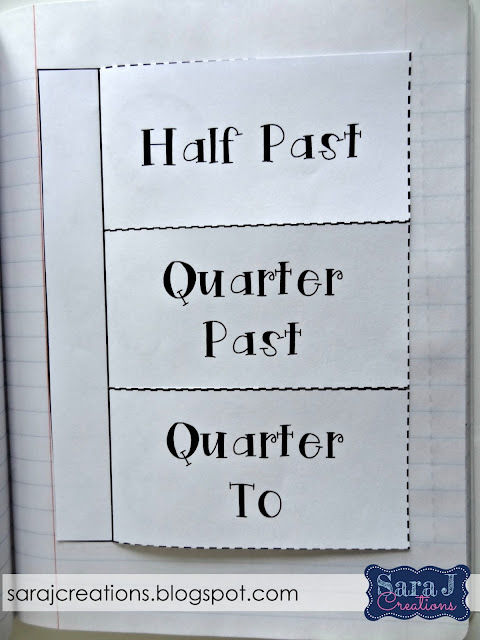 These are similar to my Money Centers that I blogged about last month. It includes 8 ready made centers that are Common Core aligned for second grade. Many of these could also be used as a review with third graders. Each center comes with student directions, along with suggestions for use if there are multiple ways the product can be used. 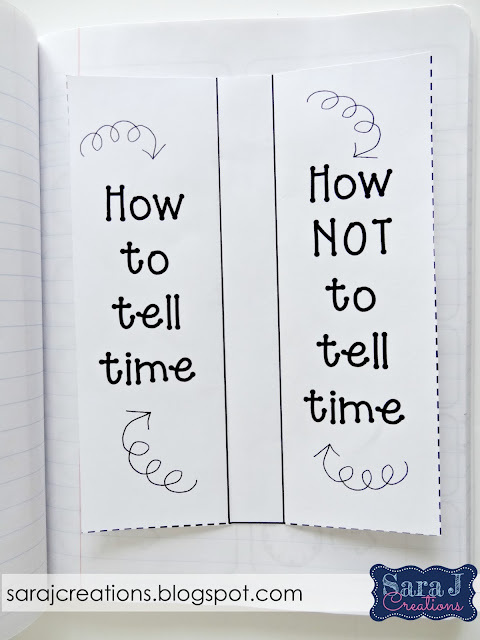 All centers practice telling time to the nearest five minutes. 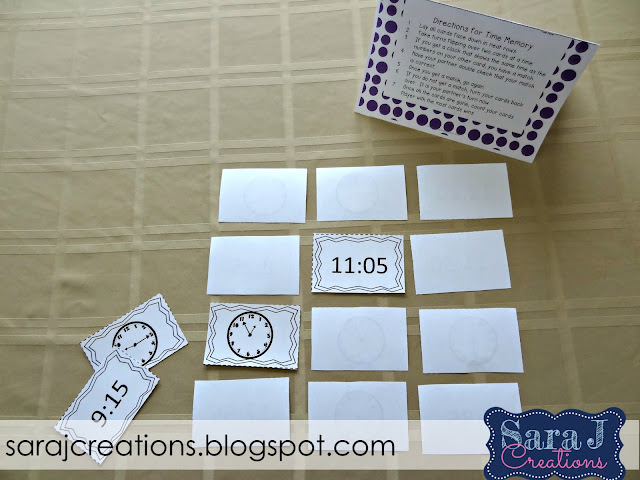 This includes cards with different times to the five minutes. For each time, there is a clock version and a digital/number version. You can use these to play memory (as shown below) or Go Fish. 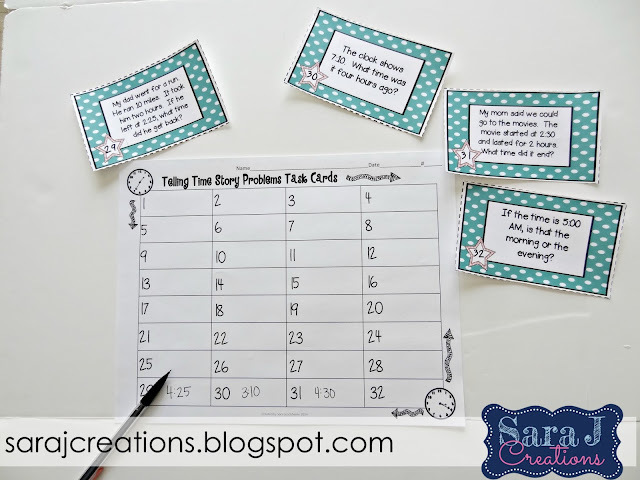 This set includes 32 task cards that each have a story problem that deals with elapsed time. These are designed as a challenge for your average second grader. 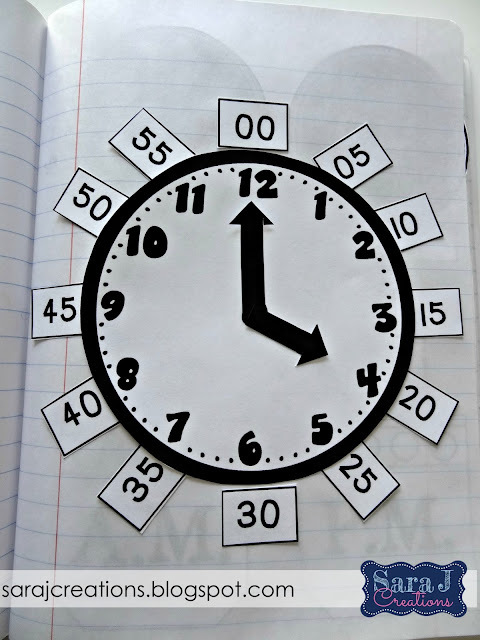 It would be a perfect activity for your higher students that need a challenge and are comfortable telling time already. This activity includes 72 clocks that tell a variety of times. It also comes with the category headings shown below. Students need to sort the clock pictures by the number the minute hand is showing. This includes 32 task cards. Half the problems involve reading and writing the time shown on a clock. 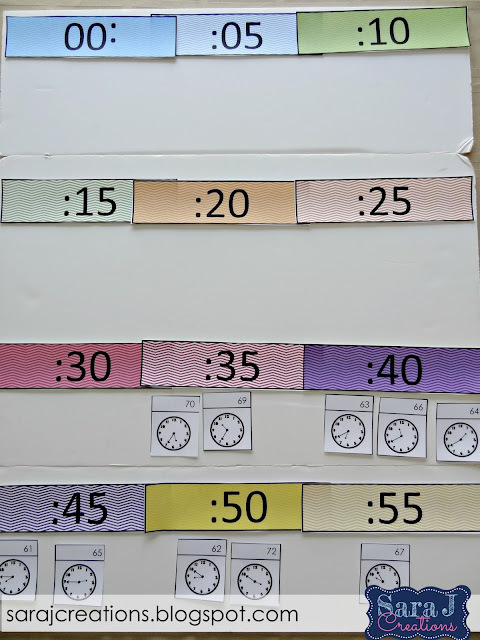 The other half give students a blank clock and they must make the time that is shown on the task card. 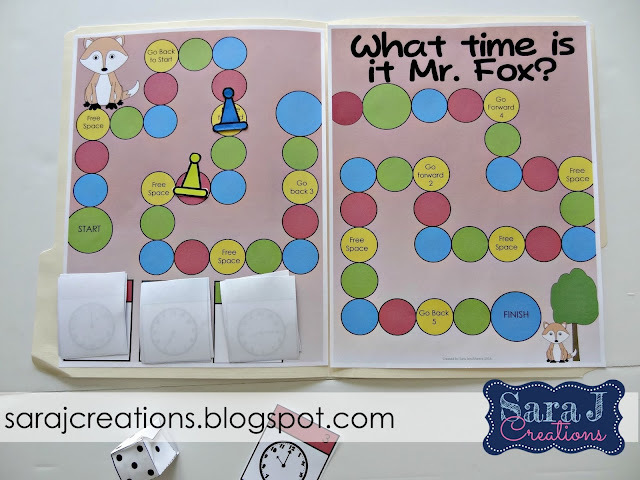 What Time is it Mr. Fox allows students to practice telling time while trying to be the first person to make it to the finish. Includes printable game pieces and dice, or you can supply your own. 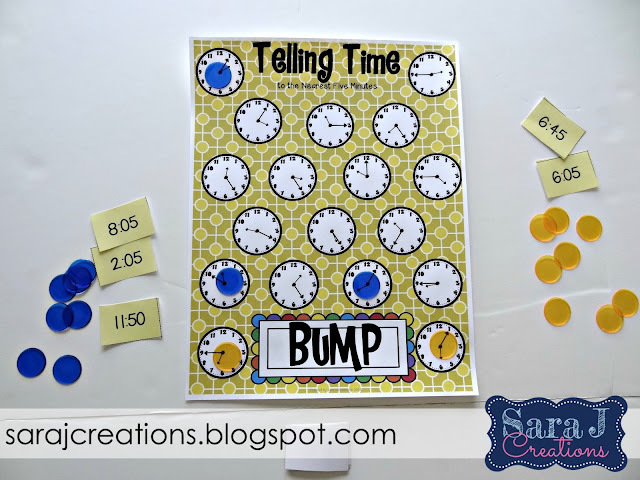 This game includes the pieces needed to play bump. It also includes directions on how to play. Basically, you draw a card, find the clock that matches that time, cover it with your color chip. If the other player gets the same time, they can BUMP your chip off that space. If you get the same time twice, you put two chips on it and lock it down. That means you can't be bumped on that clock. The first player to use up their chips is the winner. 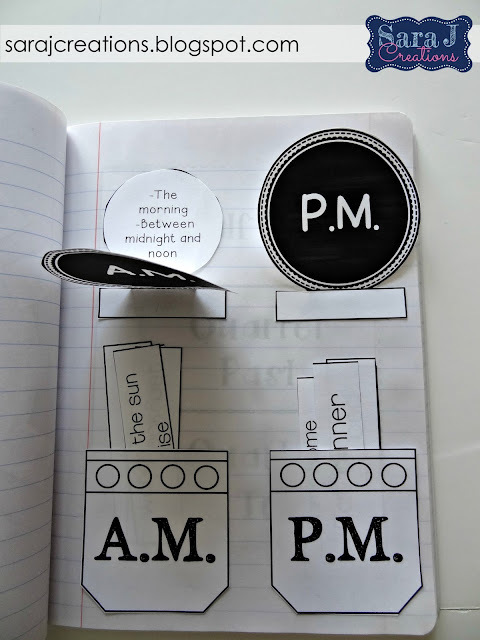 I've also included six activities designed to be interactive notebook pages. These can be assembled whole group or they can be something each student creates during that center. These pages will be a good reference for your students throughout the year. 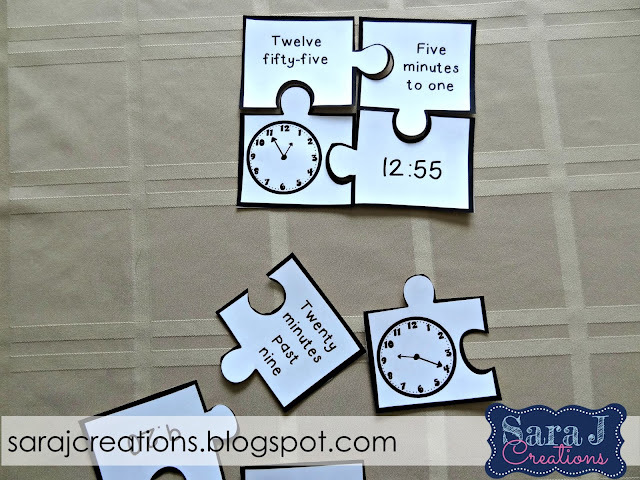 These puzzles include a time that is represented in four different ways. Students need to find the matches to assemble the puzzles. So, what do you think? Are you ready to win this? Just enter the rafflecopter below for your chance to win. No following necessary, just enter your name. The winner will be contacted tomorrow. If you are interested in purchasing this product, you can find it HERE. What an awesome product. I LOVE the interactive math journals. So cute! Thanks for linking up, friend! Love this!! I would LOVE to use this in my Grade 2/3 Class! !